* In above, the most intense thunder I experiences was on early morning of Friday 2nd May, 1997 when ‘I had to put my hands on my ears’ to try to be safe from ‘thunder blasts’. 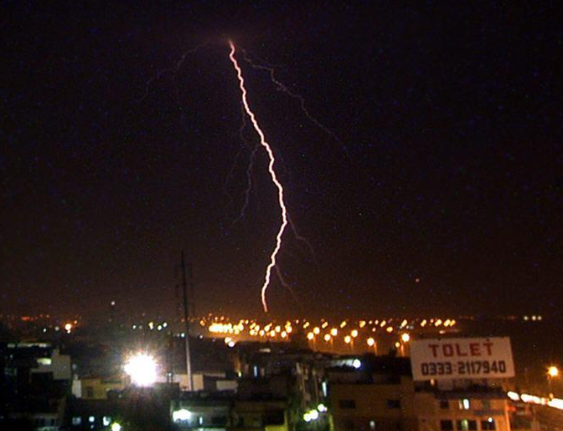 And on 5th & 6th December, 2008 people of Karachi experienced some sharp thunder bolts. and also on 6th september this year at evening-night…. in 2008 december what was the reason of rain ? wd or tropical activity? The WD is moving away, few more passing showers could occur after that it would be dry… no fresh wd till few days.. I see lots of clouds in the sattelite over most of Punjab and kpk…Are these rain bearing clouds? And will it rain in Lahore during the weekend? some chances of isolated shower on October 19 night till October 21 morning due to fresh wd 03..
Nice weather in Lahore with very heavy lightning and high winds plus moderate rain.Weather has turned cool. I was surprised because there was no forecast for rain in lahore. What has caused this thunderstorm to develop? Trough of WD 03 was extending to north-eastern Punjab, it is over Indian Kashmir. It was an “unexpected” formation.. When will you post next Pakistan weather update article? its raining, heavy thunder and lightning with heavy winds now at the moment in Karachi….and its 5:30am Thursday Dec 13th 2012.